Well!! Here I am again; I had intended to blog every week this year, and life just keeps getting in the way!! But I have finally found a spare minute again, so I thought I would try to update the blog with what I have been up to. I finally finished my Dryad necklace - and (GASP) entered it into BeadDreams 2010!!! I am so excited to have entered into such a prodigious competition, and I can't wait to see all that entered their pieces in as well. Please come over to my website and check out the rest of the photos of Dryad, I love to have company!! Dryad took quite awhile to visualize and make, and so I have been doing some smaller pieces since. But I already have another idea (or two) for more pieces on that scale, and am itching to get at them, so it won't be long now until I hunker down over some more embroidery. For now, I have been concentrating on some beadweaving. 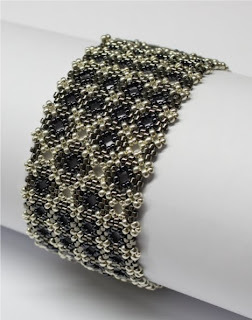 I made a smallish bracelet (no pictures yet) with three lengths of Russian Spiral - all in 15s!!! When using all the same size beads, rather than putting larger ones in, the spiral looks quite a bit like delicate netting - especially when done with the smaller beads. I really enjoyed making it, and am thinking of another, longer bit that could be a necklace. Above are a few of my favorite bracelets Sabine has made. 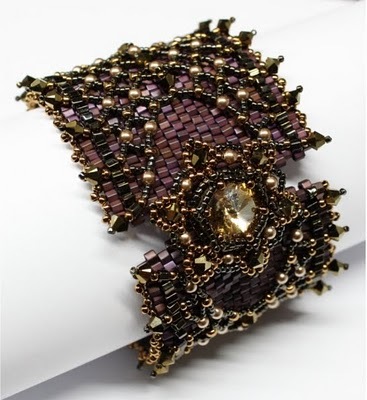 The first two photos are of Network, a gorgeous cuff that really grabbed my attention. I LOVE how she made the netting over the peyote base, and the colors just drew me right in. 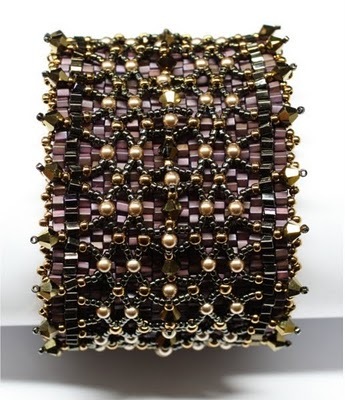 The third photo is one of her newest weaves, and this one is called Golden Ivy. She also made a silver one titled simply Ivy. I love how they curve and flow, and how the components really do make you think of dainty little leaves. 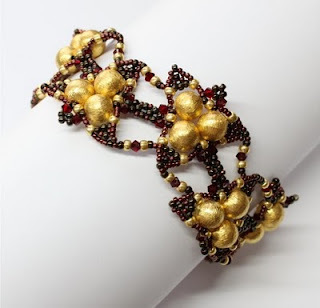 The next photo, below, is Sabine's Maze Lace bracelet - and this is the pattern that she has FREE on her website - isn't it GORGEOUS!!!! And now, this is my variation of her pattern. I chose to use bright copper, bright silver and matte black for a palette, and added tiny little cube beads into the diamonds left open in the weave. I had the absolute BEST time weaving this - the steps in it just have the smoothest rhythm to me. If Sabine doesn't mind, I may make another as a gift for a friend... this pattern is addictive! Sabine has soooo much more for you to look at, both patterns (free and for sale), her book, her blog, and her website. I really encourage you to go and look, and find a pattern for something you would like to create, too! Website: www.trytobead.com. Blog: try-to-be-better.blogspot.com. And her Etsy shop: www.trytobe.etsy.com . Have fun browsing!